Simply the best mix for coating fried chicken, pork chops, beef, fish, seafood and vegetables. 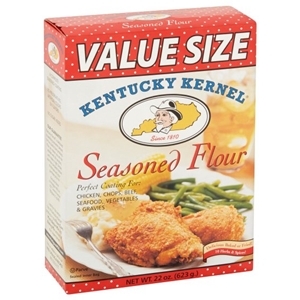 This special blend of premium flour and 10 savory herbs and spices is the "family secret" of generations of cooks. The spice blend is a closely guarded secret, because it perfectly complements so many different foods as a batter or coating. Plus it makes the best sausage gravy you've ever tasted! Great recipes are on the box, and for an easy, lower fat alternative to fried chicken, try oven-baking. Enriched and bleached white flour (niacin, iron, thiamin, riboflavin, folic acid),salt, spices and natural flavor.